The UN Declaration on the Rights of Indigenous Peoples, or UNDRIP, is routinely cited by activists, academics and non-governmental organizations as a universal framework of minimum standards for the survival, dignity, well-being and rights of the world’s indigenous peoples. The UN General Assembly, in adopting the declaration on Sept 17, 2007, referred to it as a “major step forward towards the promotion and protection of human rights and fundamental freedoms for all”. Such claims are in desperate need of revision, much like the UN Declaration itself. 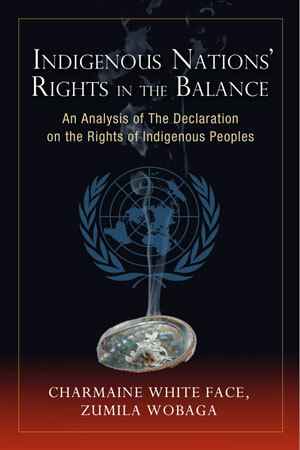 In her new book, Indigenous Nations’ Rights in the Balance: An analysis of the Declaration on the Rights of Indigenous Peoples, Charmaine White Face exposes the UN Declaration as a deeply flawed document that was not endorsed by the world’s Indigenous Peoples and Nations. In the pages of Indigenous Nations’ Rights in the Balance, Charmaine White Face, an Oglala Tituwan woman, grandmother, writer and activist from Pine Ridge Reservation, provides a well-researched analysis of three different versions of the Declaration that culminated in the final version that was famously passed after a General Assembly vote of 143 in favor to 4 against, with 11 abstentions. Acting in her capacity as the official spokesperson for the Sioux Nation Treaty Council who participated in the process to develop a sound declaration for all Indigenous Peoples, Charmaine White Face also offers her own insights about the differences between each declaration, commenting on each change and their ultimate effect on the meaning and integrity of the document. Recognizing also that indigenous peoples have the right freely to determine their relationships with States in a spirit of coexistence, mutual benefit and full respect. The statement is straightforward enough. Given that we’re talking about a Declaration of Rights, there should be a provision identifying The Right of Indigenous Peoples to determine their relationship with a State, as opposed to having it forced upon them by the State. In the second draft of UNDRIP, written by chairperson Luis Enrique Chavez of the Working Group on the Draft Declaration (WGDD) and passed by the UN Human Rights Council in 2006 (by a vote of 30 in favour and 2 against with 12 abstentions) the paragraph in question remained. “Solemnly proclaims the following United Nations Declaration on the Rights of Indigenous Peoples”. “Solemnly proclaims the following United Nations Declaration on the Rights of Indigenous Peoples as a standard of achievement to be pursued in a spirit of partnership and mutual respect“. “1. Indigenous Individuals have the rights to life, physical and mental integrity, liberty and security of person. “Changing the phrase and to full guarantees against genocide to the phrase shall not be subjected to any act of genocide alters the full meaning of the Article. The Original Text stated that Indigenous Peoples have the right “to full guarantees against genocide.” The HRC and GA versions do not address this right. Rather, the HRC and GA versions state an action that needs to be enforced, but it does not say how it will be enforced. The Article, as it was changed, is written as a law, rather than as a Right. All in all Indigenous Nations’ Rights in the Balance: An analysis of the Declaration on the Rights of Indigenous Peoples should be considered essential reading for anyone that’s working to defend Indigenous Rights on the international level. Not only does it provide a long-overdue analysis of the UN Declaration, it establishes the need either for a new declaration or the revision of the presently inadequate document and perhaps the addition of a second document specifically for States. The book also offers an important glimpse into the bureaucratic process of the United Nations that Indigenous Peoples have been forced to contend with since its founding. It is a process of forcing Indigenous Peoples to settle for less–in this case, at the direct expense of the meaning of Indigenous Rights–for the benefit of States too rigid and myopic to work alongside Indigenous Peoples and Nations for the mutual benefit of all.